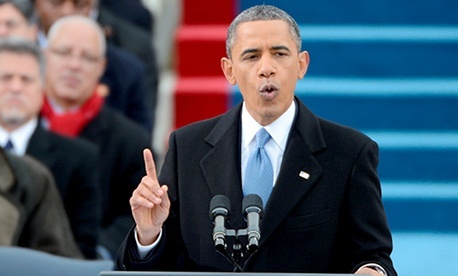 President Obama's second Inaugural had a lot to say about relations between the sexes. To begin with, this was the rainbow inauguration. From the selection of speakers to the speeches themselves, the full diversity of America was on display. Michael Cohen of the Century Foundation tweeted: "A Puerto Rican Sup Ct Justice, a black invocation speaker, a Jewish emcee, a Southern senator, a black president, a Brooklyn choir #America." And President Obama described the tides of U.S. history as waves of one social movement after another seeking the rights guaranteed them by the Constitution and the Declaration of Independence: Seneca Falls (women), Selma (African-Americans), and Stonewall (gay and lesbian Americans). He was setting the stage for finishing unfinished business for women and for the LGBT community, as well as for immigrants and for social justice overall. Obama's speech and the ceremony as a whole made me proud and happy. The poetry and power of his language, his vision of what this country has been and can be again, his knitting together of the tapestry that is America brought a lump to my throat, one more time. But after the passion of the moment, I am left with the sober realization that Obama still hasn't taken to heart the full extent of discrimination against women. The reason women's rights and gay rights are unfinished business is that both women and non-heterosexual men and women still deviate from the unspoken norm, the unconscious, reflexive view of what a breadwinner, a citizen, or a bridegroom looks like: a straight (white) man. Indeed, it's precisely this "deviation," or difference, that makes diversity so valuable; people who look different are treated differently by others, have different life experiences, and bring different perspectives to the table. But until we change the norm itself, learn to reshape our workplaces and our expectations around a different image of what normal is, those differences will still be penalized. Obama seems to miss this deeper connection. One of his most rousing lines was his claim that "if we are created equal then surely the love we bear to one another must be equal as well." That was his reference to the struggle for gay rights. For women he said, "For our journey is not complete until our wives, mothers, and daughters can earn a living equal to their efforts." Equal pay for equal work certainly remains an issue for women, but women who do not have children earn the same or more than men. It is children who make the difference for the women who take care of them either as primary or even as equal caregivers. We do not have enough men in this position to have reliable data, but anecdotal evidence strongly suggests that men who are primary or equal caregivers pay an equal penalty.